Hey everyone! I am not going to talk about the awful MN weather today. Nothing I can do about it, so I am instead making the most of my day with another Pinspired outfit. I found this pin off of Heather from Style Journey's Pin boards - I swear sometimes her and I are style twins - anyway, I had some items to kind of duplicate this one, so I gave it a go. I opted for a blue sweater instead of a green one, I could probably wear this outfit again this spring with an actual green sweater instead. Today I needed the extra warmth, so that is why I chose the blue one. And hey, why not add a fun summer straw bag even if it's anything but summer like outside. I love this one I bought at the Tandem Vintage sale, it has tons of room in it and will be awesome this summer for shopping or a beach day. Today it is just brightening up a wintery day. Also giving me some sunshine today? My fun new jewelry from Jasmine's giveway! My package from her showed up over the weekend and I'm super excited about the goodies she sent. 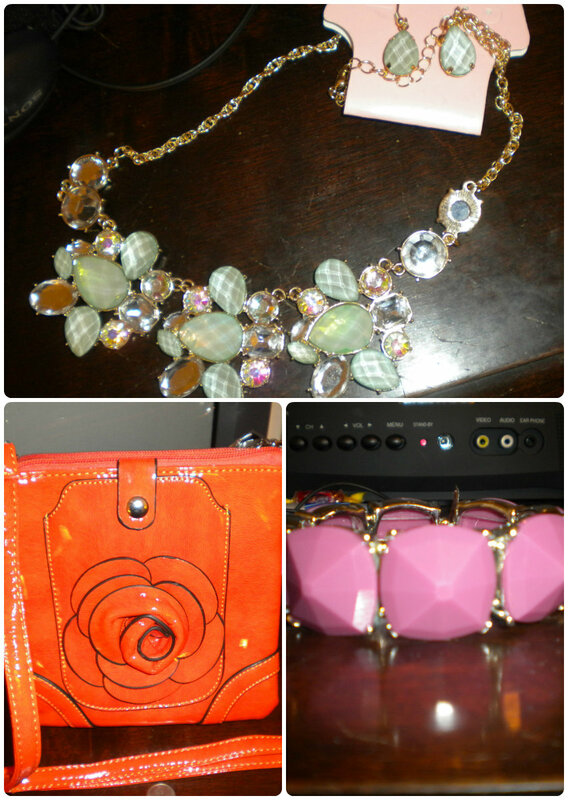 Not only did I get this pretty minty colored necklace, but also a fun orange crossbody purse that will be good for a night out and a cute purple bracelet that actually fits my tiny wrist. Here is a photo of all of the items - I can't wait to play with them more! Thank you again Jasmine! So I found a way to add some sunshine to my day. To make lemonade from lemons. To look on the bright side. Just call me Pollyanna! I love navy and green together! I can never find bracelets that fit my tiny wrists either. Enjoy all your new goodies! Love that outfit and the necklace! Um - that orange purse - LOVE IT!!! It's pouring rain here, ugh. i love your new pink bracelet...what fun stuff!! anything to brighten our days!! That necklace looks gorgeous on you! So glad you liked all the items! Can't wait to see you rock that orange crossbody bag! A great idea! I wish I could find more inspiration from pinboards. Mostly I just find food. ;) We're getting the rain tomorrow, but not before a beastly heatwave. I have things to look forward to though, so I'm not complaining... too much. That's the right attitude to have. :) Love that statement necklace - so fun!